If you are suffering from incontinence you need to purchase Attends diapers. This brand of adult diapers is one of the best values on the market in offering you greater protection and comfort. Dealing with incontinence is never an easy thing and the emotional turmoil that comes with incontinence can be incredibly challenging. Many people end up having issues with depression in addition to incontinence as the embarrassment can be debilitating. It can also cause people to miss out on social situations as the fear of never knowing when you may end up with an incontinence episode can be stressful. Many people will withdrawal from social settings and will stay home to deal with their condition. Don’t let incontinence run your life! You can gain control over it with the right type of incontinence products and dietary changes. 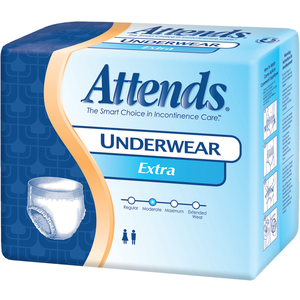 The Attends adult diapers offer a number of absorbency options, making it easier on you to find products that will benefit your life and can help you to enjoy being social again without needing to worry that you will have an accident in public. When a person is dealing with incontinence, it will mean that you can have the involuntarily loss of urine at any moment. Your body will not signal when you need to urinate and it can cause you to release a small trickle or a large amount of urine. Incontinence can strike at any age. It is commonly seen in women compared to men and quite common to people over the age of 65. In fact about 12 percent of Americans over the age of 65 are currently dealing with incontinence. With a large percentage of baby boomers getting older, the need for incontinence supplies and treatments will only grow. Attends is one of the brands out there that understands the demands that people have and they do work hard on coming up with new incontinence products that will keep you dry and prevent you from having urine leaking onto your clothing and possibly on your furniture. Managing incontinence comes down to choosing the right Attends diapers along with adding some new things to your life. Exercise is one of the best things to do for incontinence. Keeping your weight in check will prevent you from having too much stress and pressure placed o the bladder, which often causes you to end up having urine leak from the bladder. Exercise can also aid in strengthening the muscles so you will be able to hold in the urine that does try and escape from the bladder. Changing your diet can also help. Certain foods are known to stimulate the bladder and will force urine to escape without your control. Reducing your intake of soda, especially soda with caffeine can reduce incontinence. If you are caring for a loved one that has incontinence, you need to look into Attends adult diapers that include Velcro sides. This makes it much easier on you to manage incontinence as you can pull the sides off, toss the diaper and get a new one back on easily. Keeping the skin clean is also important to managing incontinence correctly. Urine that sits on the skin will end up causing a rash and an infection to occur. If the skin isn’t kept clean it is common to see bladder infections, which can be fatal in elderly individuals. Attends adult diapers are affordable. Purchase the right size so it will fit snugly on the skin to prevent leaks from happening. You also need a fit that is comfortable so the skin can breathe and so you do not have a rash occur when you are moving around.